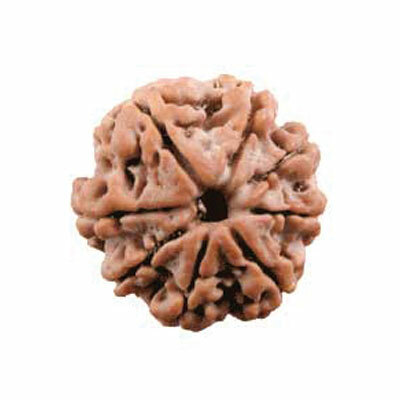 Eight faced Rudraksha or Aath Mukhi Rudraksha has eight natural lining on its surface. This bead is generally found in oval or round shape. The ruling planet of this bead is Rahu (North Node of Moon). In Astrology, Rahu is considered very powerful and is known for creating obstacles in the life of a person. Positive Rahu gives immense political power and prosperity. If Rahu is weak by virtue of placement in the horoscope, this bead helps in removing all the negative effects of the same. Deity of this Rudraksha is Lord Ganesha who, as per Hindu belief, is known the only deity to remove the obstacles from a person’s life. In every auspicious ceremony amongst Hindus, Lord Ganesha is always worshipped first so that ceremony is completed without any obstacle. The wearer of Eight faced Rudraksha hardly faces any obstacle. He gets success in life and no enemy can harm him. This bead also protects the wearer from evil spirits, accidents and misfortunes. Rahu is known to have mysterious qualities. So are the diseases given by Rahu. This bead helps in curing the mysterious diseases which are not easily detected. Some persons are terrified by the bad dreams. This bead relieves them from such dreams. This bead should be worn around neck in red thread. Astrologers who are involved in Occult Science should wear Eight Faced Rudraksha.